This Light Award is sponsored by Quick Chicken Soup and processed through Kiva.org. Jamine is a 30-year-old young man and a father of one girl, aged 5. He lives in Johannesburg alone, but supports his unemployed young brother. Jamine is a trained and skilled computer hardware specialist. 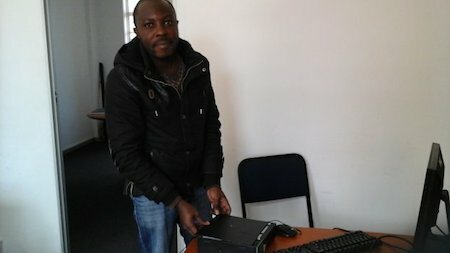 He makes a living selling and repairing computers for his customers. He also does networking and software development. Jamine has many customers but his working capital is low and as such customer orders are delayed as he looks for funds to buy new stock. He is seeking a loan to buy a stock of new computers and computer accessories to improve the delivery of customer orders. The demand for his services is high and he will be able to repay the loan. Congratulations to Jamine in South Africa!